This is my beautiful grandson (Ajani Frederick Thomas) with the women in his life. 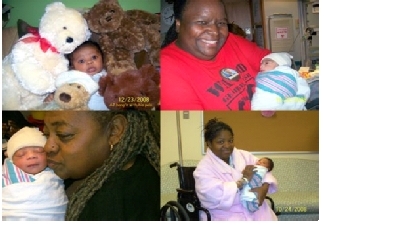 His Nana (that’s me holding him five minutes after he was born), his Nalo (Swahili for Grandmother – that’s Constance holding him right after birth) and his Mommie (Roslyn holding him on his first bath day on his second day in the world). He was born on October 22, 2008 at 6:31pm and weighed in at 5.4 oz, 17 1/2 inches long. Now I know why everyone says their baby is the most precious, most beautiful baby in the world. I’ve never experienced anything like this in my life. I began loving him before he was born. I participated in his birth (it was awesome!!!) and I never fail to take a picture or video of him when I see him. He is a happy baby, very attentive and he loves to be talked to, read to and sung to. He has begun talking himself (baby speak) and I’m loving it. He makes me a better person and I only want the best for him. There are over 2000 pics/videos of him and counting. So this is what unconditional love really feels like.